Loose skin or fat on your stomach can leave you feeling self-conscious about your appearance. By adopting a healthier diet, a regular exercise regimen and losing weight at a slow pace, you can eliminate your jiggly stomach and gain a more toned and taut appearance. Likewise, once you get rid of the excess skin or fat, your positive lifestyle changes will help you maintain your new svelte figure. Eat a balanced diet every day. Choose lean sources of protein like turkey and chicken, healthy fats like those derived from avocado and nuts, whole grains, fruits and vegetables. Drink at least eight glasses of water a day to stay hydrated, prevent bloating and ensure proper digestion, says Health Services at Columbia University. Perform cardiovascular exercises on a regular basis. 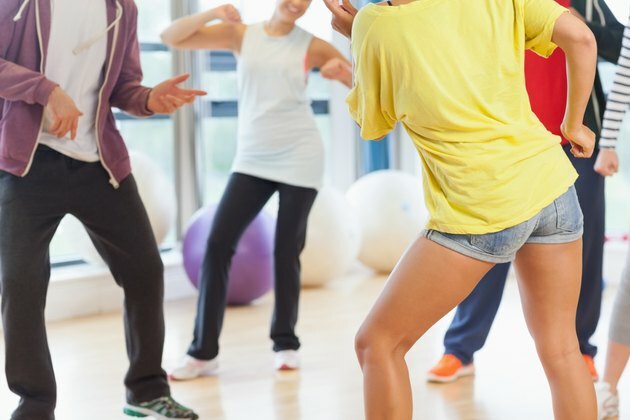 Get at least 30 minutes of activity five times a week to stay healthy and even more to lose weight, according to the American College of Sports Medicine. Running, walking, jogging or swimming will help you lose weight all over your body, since spot reduction on the stomach is not possible. Build muscle to increase your caloric burn. Lift weights and perform bicep curls, triceps dips, leg lifts, dumbbell squats and shoulder presses as well as any other exercises you prefer at least twice a week, suggests the National Academy of Sports Medicine. Do three sets of 15 repetitions of each exercise. Tone your stomach to tighten your abdominal muscles and reduce the look of loose skin that can contribute to a jiggly appearance. Perform three sets of 15 repetitions of sit-ups, crunches, Pilates and any other abdominal exercises you prefer at least three times a week.